Bonsai trees live in pots, a small world as compared to the trees’ natural habitat. Because of its limited space and pots bounded by the dimensions, small bonsai pots can become easily root-bound. As bonsai trees grow, their roots take the place of the nutrients used in the soil. Bonsai trees cannot survive if they don’t have enough amount nutrients and water in the soil and the soil’s proportionate amount. As new bonsai roots are produced, the older bonsai roots should be pruned because they become ineffective. Let’s start learning about repotting bonsai trees today! Bonsai trees thrive in pots given the right type of soil, temperature, humidity, nutrients, water, and maintenance. Let’s learn the facts, tips, and considerations when repotting bonsai trees. Repotting your bonsai trees should be done once the soil becomes compact and very hard. It doesn’t mean that the bonsai soil should be kept granular and loose. Keeping a bonsai tree in a slightly pot-bound condition can help slow the growth and allow maturation. Doing so can reduce the length of the internodes and increase flower production. It also increases the aged appearance of your bonsai. But if your bonsai cannot obtain adequate water into the soil, you need to take action. Algal slime and liverwort form on the surface of the soil. Reduced viability of the leaves (discolored leaves and dropping of leaves after a few weeks during summer). When is the best time to repot a bonsai tree? The best time in repotting bonsai trees is late winter. Most species of bonsai trees are usually repotted every mid-February, and they can be repotted again as needed in the growing season. During winter, bonsai trees are dormant and they rest and get ready for spring. Juniper bonsai trees are evergreens and do not lose their leaves. Junipers go through a dormancy stage in a similar way. Severe transplanting and root pruning can be pretty stressful to bonsai trees. Pruning bonsai roots must be done before the growing season starts because that’s the time when the cut root ends start repairing themselves. During this time, roots are more prone to root rot and other diseases. Why is repotting bonsai trees necessary? Because bonsai trees live in pots, the space to draw nutrients and water in the soil is limited. Unlike the trees growing in the wild, the root system of bonsai trees cannot expand in a small pot. Proper soil proportion is needed, so repotting is deemed necessary. This is the best time to prune old roots to allow space for new and functional roots to grow. How often should repotting bonsai trees necessary? For younger bonsai trees, you need to repot them at least once a year. For older and mature bonsai trees, you need to repot every three years. It is important to check the roots for you to determine if repotting is required. If you can take out the bonsai tree from its pot, and the root ball of the bonsai comes out in just one piece, this is the perfect time to repot. Do you need to transfer your bonsai tree in a bigger pot? This is not necessary. Repotting your bonsai does not mean replacing the bonsai pot. Repotting means just basically replacing the bonsai soil. Although most species of bonsai trees like Junipers get bigger yearly and may need bigger pots for their aesthetics and health. Will cutting or pruning the roots kill your bonsai tree? When it comes to combing and pruning the roots of a bonsai, it does not mean cutting off the bonsai roots. Root pruning is done to remove ineffective and old roots, and so as the new roots if they have become very long. The bonsai tree’s root system moves nutrients and water up to the top through transpiration. It is like the reverse of photosynthesis. Water is absorbed by the bonsai’s root system and then is taken through the tips of tiny bonsai root hairs. The big and fat roots become useless so you can prune them away. 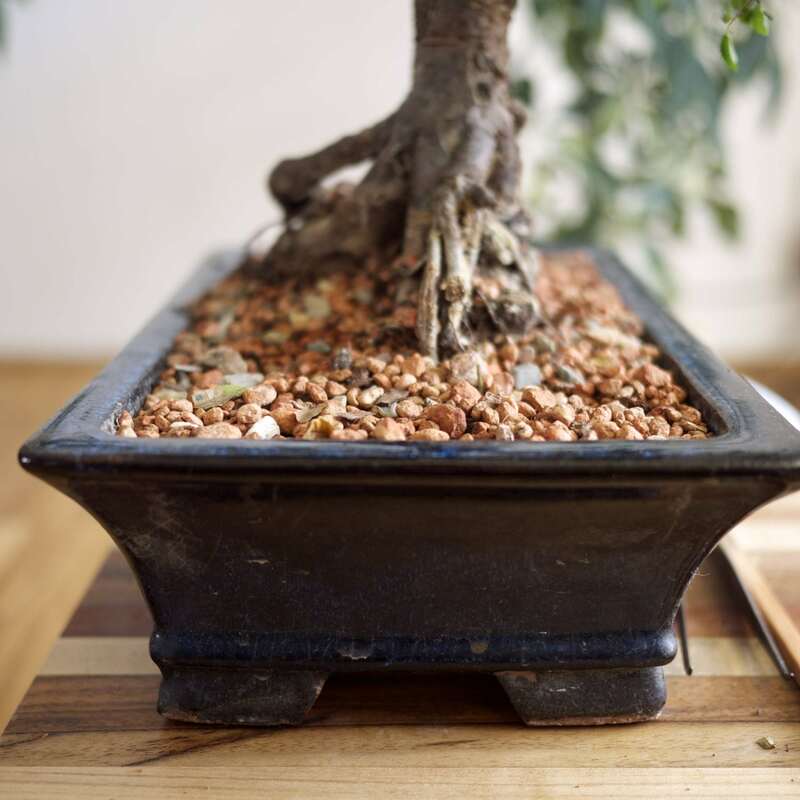 What type of soil should you use for bonsai trees? You can use a bonsai soil potting medium that is specifically blended for your bonsai tree. It should be well-balanced and mixed to ensure proper drainage of water. Buy a “double shifted” potting medium with big chunks sifted out and so as the small particles. The dust coming from peat moss can choke out tender new bonsai root growth. Tip #1: Repotting your bonsai trees out of the sun is important because exposing the roots will dry them very quickly due to direct sunlight or wind. It helps always keeping a water bottle handy so you can mist the bonsai roots as you work. Tip #2: Carefully combing out the bonsai roots is important to loosen them up, trimming the lanky, and long new roots. The small white roots are active ones located on the periphery of the bonsai root ball. You can prune any larger roots without small white roots. Tip #3: Never completely eliminate the old bonsai soil from the roots. It is good to take some of the enzymes, bacteria, and pH level from the old bonsai soil to the new bonsai soil. For most species of bonsai trees, mid-February is a good time to repot. Knowing the best time to repot your bonsai will help promote healthier bonsai trees. You have just learned the basic repotting guide. Let’s move to the more in-depth details by continue reading below. It is important to also learn about bonsai pots, although repotting concerns replacing the soil and not necessarily the pot. Choosing the right bonsai pot for your bonsai tree can help maintain healthy roots and to lessen the amount of repotting. When repotting, it is also important to choose the right bonsai pots. You have to take into consideration the depth and general measurement of your bonsai tree needs. Good bonsai pots should have good water drainage holes as well as wiring holes to be fixed to the container. Bonsai pots are usually made of ceramic or porcelain. Some growers use plastic, concrete, metals, mica, clay, wood, and stoneware. Pots made of metals may release harmful toxins so it’s better to choose other options. Guideline #1: It should be spacious and large enough for your bonsai so that the roots can stretch a little. When it comes to water and nutrient absorption, the root ends play a crucial role in the uptake of moisture and nutrients. Guideline #2: The important factors to consider when deciding to repot in a larger pot or not depends on the age of your bonsai tree, species, the presence of rootbound, and your desired size for your bonsai in the coming years. Guideline #3: Repotting your bonsai trees does not necessarily mean increasing the size of the bonsai pot. If your bonsai tree has developed and established roots, you can regularly prune the roots every time you repot, and you can also retain the same size as the bonsai pot indefinitely. Guideline #4: If you use a bigger bonsai pot, the longer your bonsai tree will go in between watering. Invest in pots intended for bonsai trees that are slightly larger as compared to the standard pot size. Guideline #5: The bonsai pot’s length must be 2/3 the height of your bonsai tree. If the height is shorter than the spread or width, the length should be at least 2/3 of the width. Typically, the width of the container should be slightly narrower than the spread or width of the bonsai tree’s longest branches, applying on both sides. Repotting must be periodically done on all bonsai species when the roots have already filled the container or pot. Repotting is important for the right supply of water and nutrients for your bonsai tree, as kept by replacing the old soil with a healthy and fresh soil. Repotting also encourages a more compact root system. For deciduous bonsai trees, repotting is required every 2 to 3 years. Evergreens, like junipers, only need repotting every 4 to 5 years. Because of varying growth and development of bonsai trees, this general rule is not applicable to all. You should check the root system for pot bound or root bound, from there, decide whether your bonsai needs to be repotted. Generally, if the root ball comes out quickly as one, the bonsai needs repotting. It is important to know the best time to repot your bonsai tree to avoid choking. Gently lift the bonsai pot with your bonsai tree to check if it’s pot bound. Consider repotting your bonsai if the roots encircle the inside of the pot and come out as one. If you neglect repotting your bonsai trees, the roots grow so thickly, and your bonsai will starve with the soil displaced. Repotting should be done during early spring when the bonsai tree is pressured for obtaining and maintaining a full foliage. Your bonsai will have less stress during repotting. You bonsai vigorously starts to grow during spring, thus helping your bonsai tree recover and quickly heal from any harm caused by repotting. Removing the old compost soil from the bonsai roots is important. Doing so will knock the old soil from the root system, and you can do this by using a root hook or your fingers. Remove heavily grown and thickly roots without small white hairs. Prune old and longer bonsai roots but retaining those with white tiny hairs or new growth of roots. After you untangle the roots, you need to remove the old bonsai roots and any rotting roots. Blackish and sticky roots manifest rotting. Don’t prune more than 25% of the root mass of your bonsai, so some roots are left for enough water and nutrient absorption. Return the bonsai tree from its pot. Reposition the bonsai tree carefully into the bonsai pot. Add the bonsai potting mix until the rim of the pot. You can avoid air pockets by working properly into the soil and its root system. Your bonsai tree will do well in a potting mix consisting of gravel, akadama, and soil compost. Akadama is a type of granular clay specifically produced for potting and repotting. Consider the ratio of the potting mixture based on the species and location of your bonsai trees. Water your bonsai tree after you’re repotting for the soil to settle. Provide utmost protection of your bonsai tree from draft and elements for at least a month to establish the roots. Repotting your bonsai trees is part of the general maintenance care. This is important for your bonsai too adapt to its new environment and to avoid getting sick and dying because of lack of water and nutrients. Bonsai soil mixtures are not the same. For your specific bonsai tree species, you need to find out the optimum soil mixture. Allow us to share the main bonsai soil mixtures for deciduous bonsai trees and coniferous bonsai trees. These mixtures consist of pumice for the good substrate structure, akadama for good water retention, and lava rock for good drainage and aeration. Bonsai trees need soil amendments such as akadama, fine gravel, lava rock, pumice, and organic soil compost. Akadama is specifically produced for bonsai purposes. You need to sift akadama before use. After two years, it will begin to break down, reducing proper aeration property. It requires regular repotting or mixed with other soil components with good draining quality. It is more expensive than other soil amendments. Pumice is a soft and lightweight volcanic product. It absorbs nutrients and water very well. It increases water retention properties. It also helps in the healthy ramification of the bonsai roots. Lava Rock effectively retains water. It helps in adding a good structure when included in a bonsai substrate. Remember that bonsai roots can’t grow into lava rock itself. An organic compost usually consists of peat moss, sand, and perlite. Drawbacks include high water retention and inadequate or poor aeration. Use organic compost to other soil amendments and it will work perfectly. It promotes a well-draining soil. It promotes properly aerated bonsai soil. It is usually used in the bottom layer of pots. Bonsai growers know very well that young bonsai trees need to grow to develop healthy trunks to achieve the characteristics needed for a bonsai tree. The “nebari” or good root will develop with the right repotting and use of correct bonsai pots. spread before planting it into a bonsai pot or container for refinement. Planting your bonsai tree into the ground for a number years is an effective and simple method to thicken their trunks. This is an unrestricted root growth to promote strong and healthy bonsai top growth. However, there are times when growing your bonsai on the ground isn’t feasible because either the suitable land isn’t always available, and your bonsai needs to be protected from frost. You also need to move your bonsai from their ground position during summer. Potting a bonsai tree is required in the art of bonsai, even if the speed of growth is significantly reduced as compared to ground or field growing, allowing you to still achieve positive results. A pot-bound or root bound bonsai tree means little or no soil sustaining and accommodating the new bonsai roots. While your bonsai tree may survive and grow new leaves in springtime, it will be challenged to develop new shoots. If the trunk lacks growth, the thickening and development will be non-existent. You can prevent this from happening by ensuring that your bonsai tree is placed in a bonsai pot that has a good space to extend its roots. Developed or established bonsai trees need root pruning to be kept in small bonsai pots while it’s still in a fresh soil. Some bonsai enthusiasts advise planting young bonsai trees into large bonsai pots as much as possible in order to speed their growth. However, planting your bonsai tree into a too large bonsai pot or overpotting is detrimental and fatal like under potting, leaving a bonsai tree rootbound. Planting your bonsai trees into large bonsai pots is not the same as planting them into the ground. In physics, the water drains from the pots until it reaches the lowest layer of saturated soil. From this point, the drainage stops and the saturated layer of soil will remain saturated. When this happens, there’s a possibility that no more water will ever drain out. The nature of the bonsai soil mix is highly dependent on the height of the column of soil. Remember that a coarser soil mix has a shallow layer or lower layer of saturated soil as compared to a finer mix and the total amount of water that is retained is lesser. From the saturated layer of the soil, water can be removed. Evaporation can remove water because of is wicked upwards as it evaporates from the bonsai soil’s surface. Water is wicked out by the bonsai root system because of foliage transpiration. Bonsai roots that are not established cannot remove water via transpiration, leaving too much water in the bonsai soil’s lower levels, and if the bonsai pot is very large, the soil has the wider saturated layer at the bottom of the pot. If the saturated layer is not removed by repotting, the normal root colonization begins to raise more problems, affecting the general health of your bonsai trees. Organic soil amendments accelerate the composting of your bonsai soil, thus losing the effective soil particles faster. The too large bonsai pot remains too wet and there is a fast decay of organic amendments because of the wet environment. The bonsai soil collapses with increased saturation, retaining more water, and the bonsai roots remain in standing water causing root failure. Prevent this from happening by regularly checking your bonsai roots, and repot as necessary. A fresh and new charge of air automatically pulls into the bonsai pot if the bonsai tree is watered properly. The majority of the volume of water comes out from the drainage holes. Carbon dioxide and other unwanted gases are then purged from the bonsai soil, and the longer these gases are left in the soil, the longer a new charge of oxygen is introduced leading to root failure. Overpotting does not require watering every day. The best environment for your bonsai trees is a bonsai soil that dries out every day. To maintain this, a good bonsai potting practice is to shift your bonsai tree to the next larger pot size after achieving an established root system, as evidenced by the formation of an intact and healthy bonsai root ball. Repot your bonsai as soon as it produces intact root balls. Apply this well-established principle practiced by bonsai experts themselves. By doing this, root pruning will be unnecessary so as not to disturb the root ball preventing shock or stress. There is a major role of bonsai roots in taking up nutrients and water from the growing medium, anchoring the bonsai tree in the soil medium. The primary function of the root is come in contact with the ‘soil water’, moving the water into the bonsai tree through the microscopic bonsai root hairs in 200 to 400 per square millimeter. Bonsai roots grow through cell division as powered by respiration, and pushing them to the soil. In order to avoid damage caused by hard soil particles, a hard cap develops, like a fingernail, to cover the pointed tip of the roots. Behind the cap, a structure is found which is a small soft and white tissue, supporting the bonsai root hairs. After several weeks, the white root tips become woody or lignify and the root hairs are lost. But since the roots are continuously extending, new root hairs keep the bonsai tree going. It only means that the roots that are feeding the bonsai tree are more than several weeks old. The same is true for those trees that grow in the ground. Repot your bonsai tree using the guidelines we have mentioned above. Of course, the species of your bonsai tree is a big factor to consider. We hope liked the tutorial and learned a lot. You may want to share this learning with your family and friends and comment your suggestions and insights below!